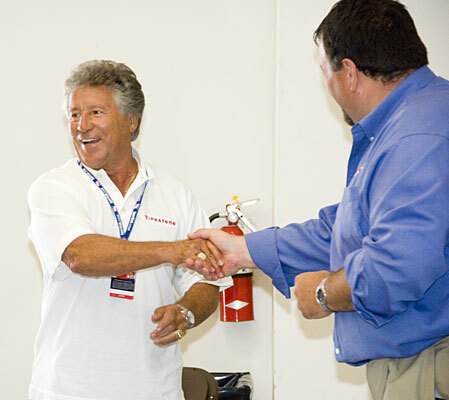 The 2006 Koni Heritage Award is presented by Mario Andretti to Doug Mockett, owner and driver of the 1978 Wolf W6. Lee Grimes of KONI North America congratulates Doug Mockett. 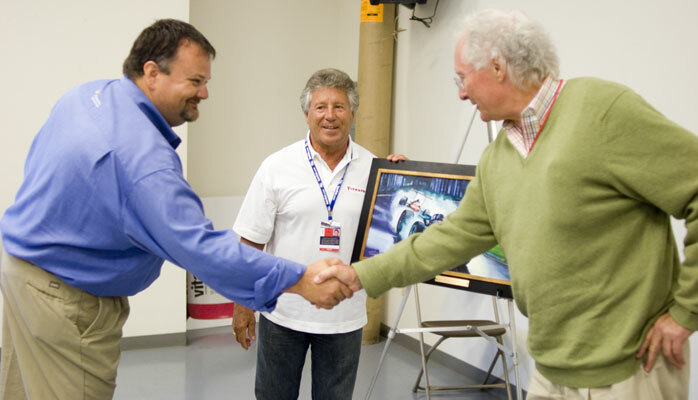 KONI North America, the world leader in shock absorber technology, has announced its second recipient of the KONI Heritage Award at the Historic Grand Prix event held in conjunction with the Indy Racing League and the Rolex Grand American Sports Car Series at Infineon Raceway. This year's honoree is Doug Mockett, who received an original painting commissioned by KONI by noted artist Roger M. Cortani. 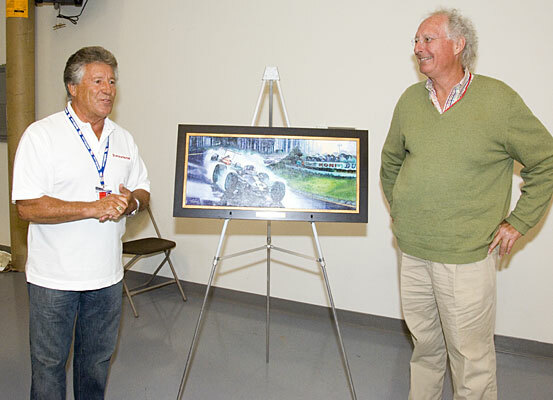 Auto racing legend Mario Andretti presented Mockett with the award. The KONI Heritage Award was created to honor participants with the Historic Grand Prix (HGP) series and is annually given to the "competitor who most clearly embodies the spirit and heritage of the era," including vehicle livery, team uniforms, and helmet graphics. The HGP is comprised of more than 50 Owner-Drivers of authentic Vintage Formula One racing cars from the FIA 3-litre Formula that ran from 1966 to 1983. Some of the cars that raced at Infineon Raceway this weekend included a 1974 Brabham BT44, '79 Tyrrell 009, and '80 Ferrari 312-T5. Each owner strives to maintain absolute accuracy and authenticity of thier vehicles. KONI shocks, the most advanced shocks in the HGP era, are fitted to most of the HGP F1 cars. Mockett, of the U.S. Virgin Islands, drives a 1978 Wolf WR6. "While the external display of spirit for the era is imporant, what we consider the ciritical ingredient to winning this award is the owner's attitude," noted KONI General Managaer Jim Vance. "We all have tremendous respect for this noteworthy period in Formula One history, and we feel it is important to salute the individual, his car, and his team, based on both their enjoyment of the sport and their participation, on and off the track." 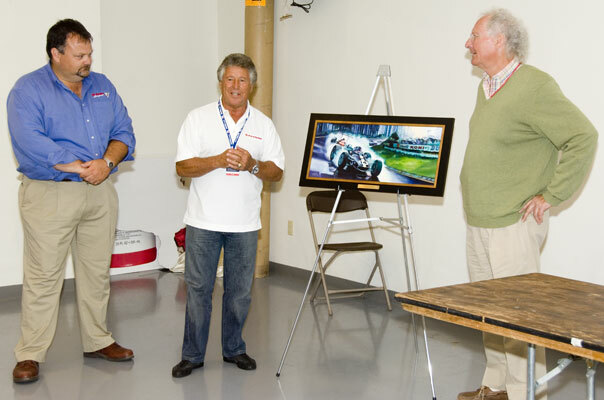 "KONI is delighted to be associated with the Historic Grand Prix in its efforts to preserve and embrace the history of this amazing time in motorsports, and we're very pleased to have Mario Andretti present Doug with this small token of our appreciation of the heritage of Formula One. 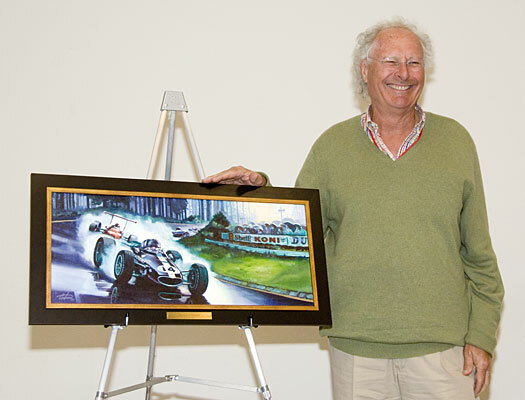 KONI commissioned artist Cortani to create a special award in the form of an original artwork depicting an F1 racecar and driver from this era. Cortani chose to portray American driver Dan Gurney driving his AAR Eagle at the 1967 German Grand Prix at the famed Nurburgring, calling his portrayal of Gurney's strong run at this challenging track "A Chance of Showers." Cortani is a graduate of The Art Center College of Design in Pasadena, California, and currently resides in Virginia Beach, Virginia. Many of his historic paintings have been shown at the Virginia Air and Space Museum, the California State Railway Museum and the Smithsonian's National Air and Space Museum in Washington, DC, as well as numerous private collections throughout the world.